Completing a little trio of american brews this 50th blog post deserves a small treat for myself. Wafts of bourbon whiskey, oak and burnt sugar coming off this when pouring. 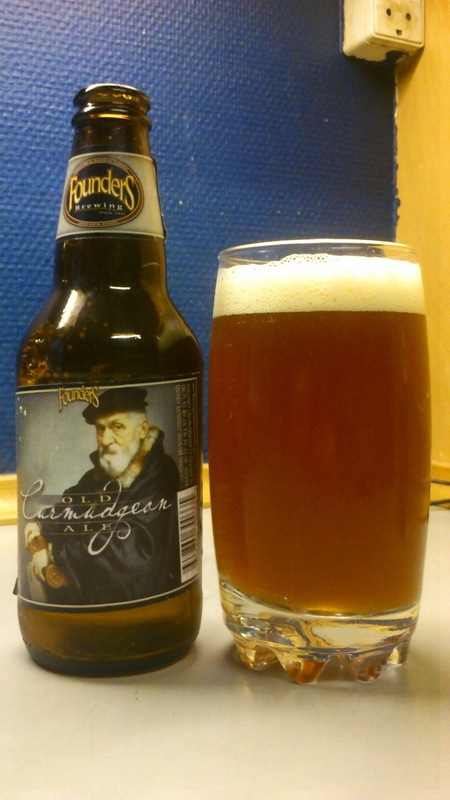 Curmudgeon pours a hazy amber red with a thin creamy off-white head. Sweet malt, bourbon again, hazelnuts, alcohol and vanilla on the intake while the finish remains sweet. There is a long aftertaste of a woody vanilla, hazelnuts and bourbon again. While the alcohol is present it does not overpower the flavours. The mouthfeel is almost syrup like without being sickly. What an absolute cracker of a beer to close the night on and for a 50th post. I was worried about the alcohol overpowering everything but I'm very happy that was not the case. To compare it to something familiar it is like an Innis & Gunn *insert oak aged barrel finish here* but a lot more richer and potent. Certainly a one bottle only beer for me. No problems with buying or drinking another though it is a type I prefer to drink in the winter months. This scored a slightly generous 9/10 on the 'right, it's still light outside but I'm off to bed' Beerometer.